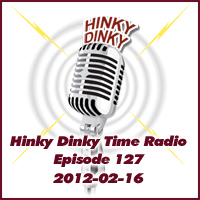 Hinky Dinky Time Radio, Episode 127 – Hinky Dinky Parlay Voo? Episode 127: Thursday, February 16, 2012. Program note: This is a restoration of the music. The recorder crashed and tha actual program is not archived.